A new job, a new Walnut desk! Posted on 23 August 2016 in english hardwoods, furniture timber, joinery timber, kiln dried timber. Leave a comment! Before I started working for English Woodlands Timber I was told that I would be making my own desk. Having just coming out of college with 3 years of furniture making under my belt I was more than excited. I wanted to have a modern and simple desk which had the timber as the highlight of the desk. Posted on 10 February 2016 in english hardwoods. Leave a comment! 700mm wide boards – making instant tables!!!! The fruit of the Walnut tree is deemed a ‘super food’. Full of antioxidants, it is of great nutritional benefit to us humans, so it stands to reason that the wood of the Walnut tree is a ‘super wood’… full of incredible qualities and of huge nutritional benefit to us humans… well Ok, maybe not nutritional… but undoubtedly of benefit. Posted on 19 September 2012 in . Leave a comment! We’ve not met anyone yet that didn’t appreciate Walnut. It’s one of those timber species that people have at the top of their Christmas lists when they’re thinking of making something special. It carries a lot of weight in a design for furniture or interior joinery aesthetically but it also gets the job done in terms of service and function. Well, Walnut timber comes from one of two variations of the Juglandaceae tree family. Our English and European stock is from the same Juglans regia tree and our Black Walnut is Juglans nigra tree. 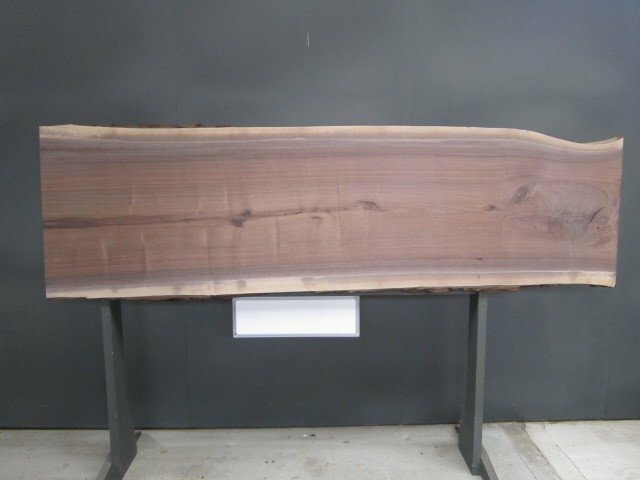 It’s also known as N.Am Walnut because that’s where a lot of this tree species is grown, but it’s also grown across Europe so if you’re interested in the provenance of your timber it’s worth checking origins. Bear with us, because when it comes to descriptions on this particular species of timber can be a little schizophrenic as there two different trees involved! So, Eng/Eu Walnut has a very varied grain pattern, it can be really swirly and wild (think gnarly growing trees) with sound knots incorporated into the flow of grain. It’s colouring is softer brown with contrasting cream sap. It’s sometimes a bit mousey until finished, but the more exciting boards are mixed with red-dy orange and give a bit of a vivid highlight to the grain. Sometimes the European is steamed to try to even out (flatten) the colouring which can be useful (?) but mainly just flattens the colour…we don’t want that do we? 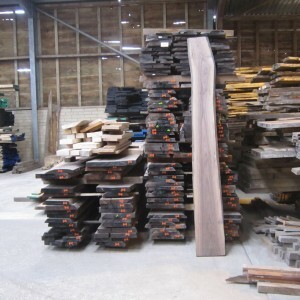 Black Walnut has a purple-y chocolate brown colouring, usually with a strong grain pattern but mostly quite straight. It’s harder to find wild patterns here because the trees just grown bigger and straighter (darn those straight growing trees!). But ‘bigger’ can be a good sign.. we’ve had some Juglans Regia recently that makes 800mm wide… that’s a tabletop right there! And of course the lengths are larger for this species too. Timber of either tree works well with machine or hand tools but of course the grain pattern is going to play a part. That wild swirlyness needs more attention as the grain will be going in all directions. It’s hard and strong (if it were bigger and less swirly we’d all be using it for structural work!) and good for turning and carving. It is difficult to treat (acid content & density) being fairly dense and also moderately durable timber. 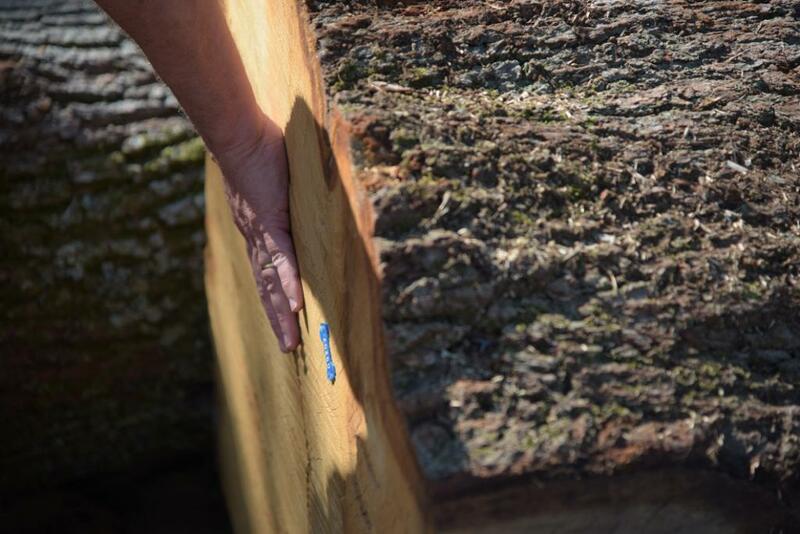 It has medium moisture movement (beware trapped moisture in dense uneven grained timbers). The right glues and polishes work successfully. Waney edge boards go from 20mm to 80mm in Thickness, currently up to 940mm in Width and up to 4.3m in Length which is pretty gargantuan for Walnut! Walnut timber is a specialist hardwood that is mainly used for furniture and interior joinery, although having said that it is durable and could be used externally too. So if you feel like creating something special we dare you to use it for external timber cladding.. we think that’d be amazing! Our stock is mixed, we keep Kiln Dried waney edge and square edge although we’re stocking more waney edge than ever to serve our furniture makers better. We find waney edge gives more value for money aswell as more creative choice and opportunity to differentiate for our customers. There is always a chance we have some boules air drying too, so if you need a higher moisture content or you want to buy complete boules for stock these might suit you. 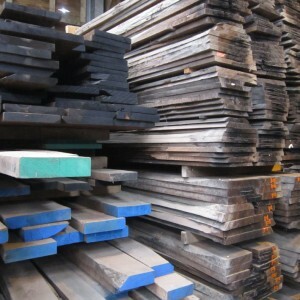 Posted on 13 December 2011 in flooring timber, furniture timber, joinery timber. Leave a comment! It’s True! The fruit of the Walnut tree is deemed a ‘super food’. The Walnut, full of antioxidants, it is of great nutritional benefit to us humans. So it stands to reason that the wood of the tree is a ‘super wood’, full of incredible qualities and of huge nutritional benefit to us humans… well Ok, maybe not nutritional, but undoubtedly of benefit. Posted on 15 March 2019 in . Leave a comment! Quirky and eclectic furniture and homeware from artist partnership Handmade in Brighton. Jude Payne and Jonathan Vigour have brought their art and craft roots to bear on home wares and furniture pieces to create well made, one off pieces with a rustic / industrial aesthetic. They love to work with sustainable, native hardwoods – Oak, Ash and Walnut – in their raw, waney-edge board form and have a great eye for spotting the unusual pieces of wood in our stock sheds. Whether you want to impulse buy or take a slow-furniture approach and commission a furniture piece these guys will accommodate you. For ways to see and buy their pieces try their houzz page for more information or get in touch via their website. Posted on 25 January 2018 in . Leave a comment! 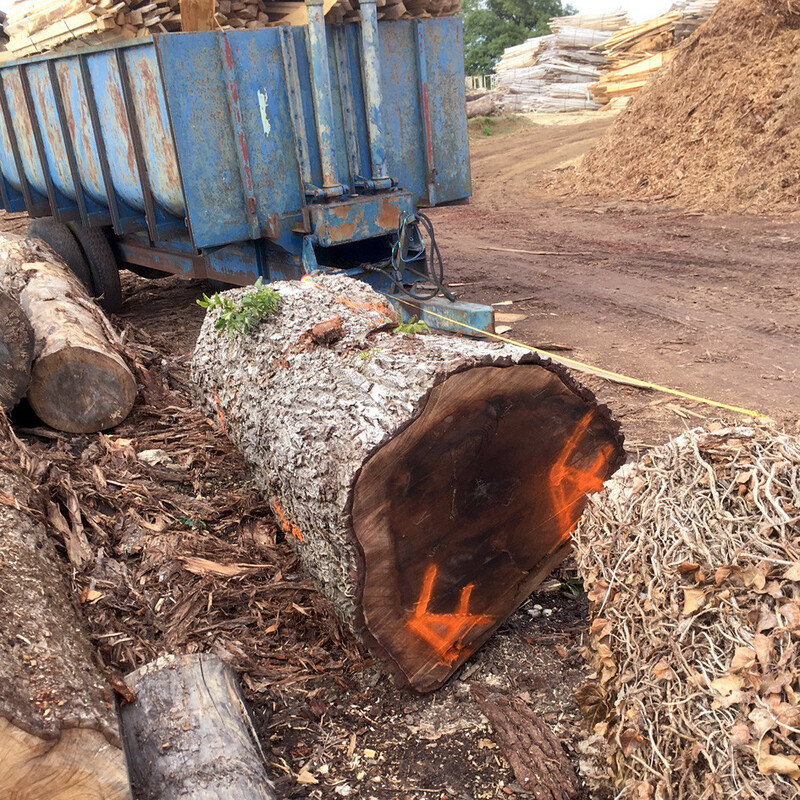 Posted on 30 October 2017 in english hardwoods. Leave a comment! …not an instrument of torture but a playground for woodfans. The Cocking Sawmills Timber Rack has been around forever (or at least 4 years!). Recently it’s taken on a life of it’s own, a sort of woodyard within a woodyard. In response to crowds of woodfans vying for elbow room in the overly stocked, single bay of racking… we’ve had a makeover. And not just any makeover. A proper makeover, with real thought and planning and everything! 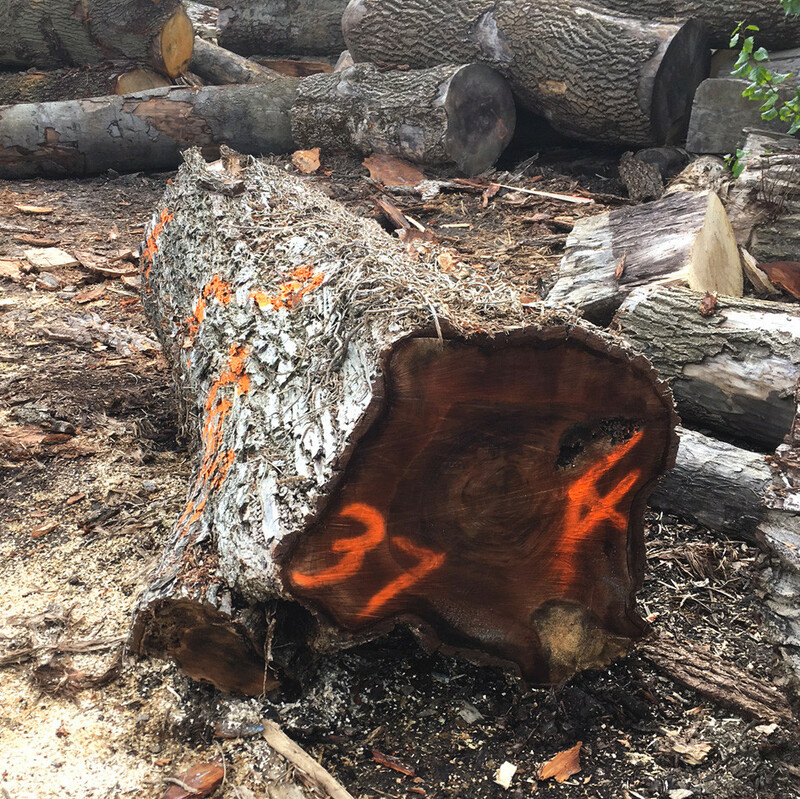 Posted on 20 September 2017 in english hardwoods. Leave a comment! 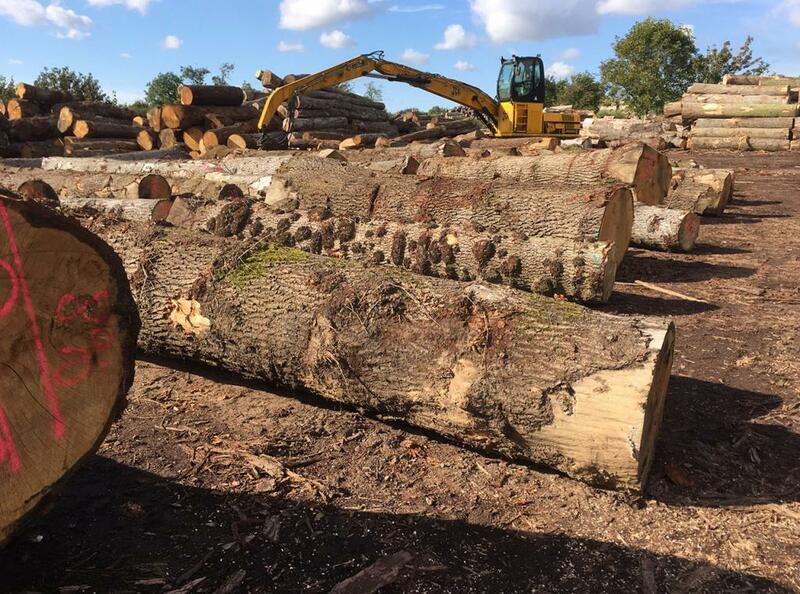 This week Tom took a trip up to Helmdon Sawmill to select our next batch of English logs for milling. As usual he’s keeping us well stocked with large dimension Cedar of Lebanon logs to make boules of 20mm and 27mm waney edge for furniture making and interior cladding. There are no Tineola bisselliella on us…! Next on the list is the sought after yet hard to come by English Walnut he’s been keeping for best. After Walnut we get a nice big parcel of Pippy Oak from the Scottish borders. It grows beautifully up there in the cooler climes. 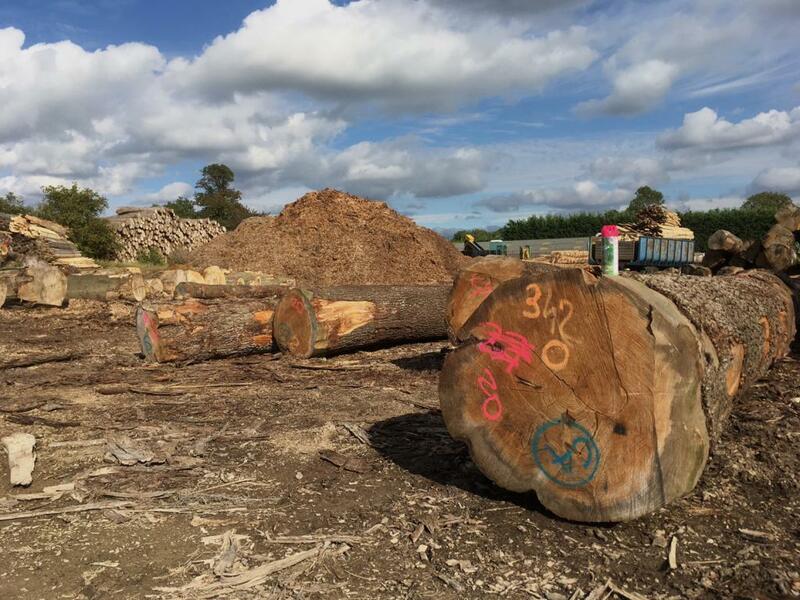 Big straight logs with lots of good looking external burring indicating we could be in for some nice medium and perhaps a bit of heavy pip. Posted on 7 June 2017 in english hardwoods. Leave a comment! Posted on 6 March 2017 in . Leave a comment!